Yesterday I taught a day-long workshop on rewriting and editing one’s work for Clarion West. I usually do this as a two hour online workshop, so it was interesting to take the class and get a chance to really flesh it out, particularly since I can use this version to create an on-demand version. The length of the piece. A novel is a much different thing than a story, and one of the basic differences is that you (or at least in my experience) can hold the entirety of a story in your head in a way that you cannot with a novel. Novels are also more complicated, usually involving multiple storylines and subplots in a way stories cannot, which adds extra steps. In this piece, I’m focusing on short story, but I’ve got an additional list of considerations when working with novel length stuff that I’ll cover in the online version, which should go up in the Rambo Academy at the beginning of December. Whether the writer’s rewrite process focuses on subtracting or accreting. 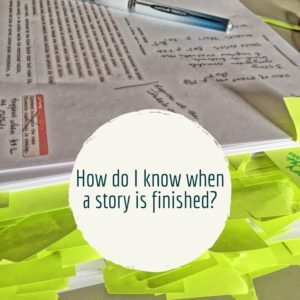 In my experience the majority of writers overwrite, and the focus of the revision process is trimming away excess. But some folks are accreters, by which I mean their process is one of adding and fleshing out. This definitely affects the revision process. Where you lie on the outliner vs. pantser continuum. Do you write out a 30 page outline before you begin writing or do you sit down and see where the words take you? My theory is that the amount of overall work a writer does is invariable; some writers do it beforehand and others do it afterwards while revising. The more outlining and prep work work that happens beforehand, the less will (usually) be necessary in the revision stage. Some stories simply need less work than others. This is the question that comes up more than any other: how do I know when a piece is ready? The way I do it is by breaking down revision into a three stage process. When you finish the last step, start sending it off, and don’t revise between submissions (unless someone gives you amazing advice). Figure out 3-5 markets and as soon as it comes back from one, send it to the next. Part of being a writer is the act of writing, letting the words flow out onto the page. It’s a joyful part when the words are coming fast and quick and wonderful. Another part is the act of rewriting, taking the results of that flow and turning them into a wonderful writing. If you know that you can do this, it helps with the act of writing, because you’re not worrying about whether what you’re writing is good or not. You know that what matters is producing the words, because you can trust yourself to make them better. If you have a lump of words, you can always turn them into something, even if it takes resorting to outrageously and wonderfully experimental techniques like a cut-up in the mode of William S. Burroughs. With a blank page, your options are considerably more limited. Once you learn to trust your editing skills, worrying about the writing’s quality will not impede the flow — at least as much, given that we are all a bit insecure. Think of trapeze artists – if you can trust the safety net that editing will provide you, you will be able to take the risks necessary to learn how to execute amazing aerial maneuvers in your writing. How do you learn to trust yourself as an editor? Read widely both in and out of the field, and read at least one classic for every piece of trash. Read what people say about the field and writing in general. Are there writers you like? They may well have written about their process, which you can usually find via their website. Look at what people do in their writing and how they do it. Here are some books I recommend: Carol Bly’s The Passionate Accurate Story, Dave Farland’s Million Dollar Outlines, Stephen King’s On Writing, Ursula K. LeGuin’s Steering the Craft, Shawl and Ward’s Writing the Other, Phyllis Whitney’s Guide to Fiction Writing, Kate Wilhelm’s Storyteller. Want to go deeper than that? 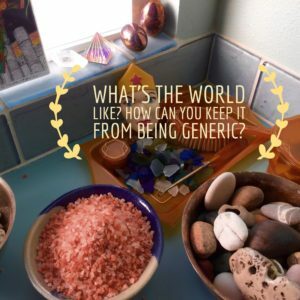 Try Wayne Booth’s The Rhetoric of Fiction, Samuel R. Delany’s About Writing, Hoffman and Murphy’s Essentials of the Theory of Fiction, Michael Moorcock’s Wizardry and Wild Romance, Jeff Vandermeer’s Wonderbook, or Williams’ Style: Lessons in Clarity and Grace. Your writing group — or your group of beta readers — is a huge asset when working with a piece. 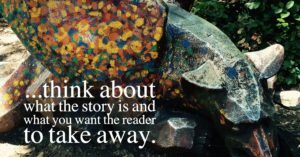 You will want different kinds of feedback from them depending on what stage the manuscript is at, so let them know: are you looking at the big picture or is the piece about to go out and you just need copyedits and minor tweaks. You do not have to take every piece of feedback that is given you, particularly if you don’t think the person understood what you were trying to do with the story. I have found that if everyone is pointing to the same thing about a story, it is indeed broken at that spot, but usually none of the suggested fixes will work and I will need to go off, think hard about it, and come up with something that works. I feel that one learns more from critiquing than by being critiqued, overall, and so participating in a writing group is part of that learning to trust your internal editor. Sending a story out into the world can be hard, particularly if you’re not sure that it’s ready. But you must. Sending pieces out and getting feedback, even when it’s a simple yes/no, is part of being a writer. Stories sitting on your hard drive do no one any good, particularly you. Good luck! This entry was posted in Writing and tagged #sfwapro, developmental editing, editing, online classes, revising stories, revision, rewriting. Bookmark the permalink. @Catrambo @alleypat or, we could just tell the truth.